Owner Steven S. Brosemer, PS 0752, is a Past President (1988 and 1989) and past Member of the Board of Directors of the Kansas Society of Land Surveyors (KSLS). Steve has been surveying in the area since 1979 and is a regular Presenter at KSLS sponsored Continuing Education Seminars, including the Regionally acclaimed Salina Seminar Series. Steve proudly serves the community in several capacities, including Past Chair of the Emporia Area Chamber of Commerce (2012), United Way Volunteer, President of the Emporia Enterprises Board of Directors (Industrial Development) and a member of the Board of Trustees of the Lyon County Historical Society. 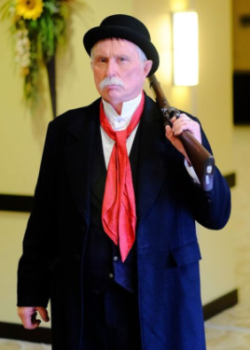 As you can see, Steve enjoys portraying an 1850’s gentleman surveyor ready for life on the prairie! Aaron C. Davis, PS 1368, is a graduate of Emporia State University in Mathematics and Physics. Licensed by exam, Aaron brings over 20 years experience to Geotech. His abilities in the area of construction staking are second to none. Aaron is as committed to modern technology as he is to the ancient principles of boundary surveying. Highly proficient in cadd and Carlson, he is the principal drafter of our complex drawings. 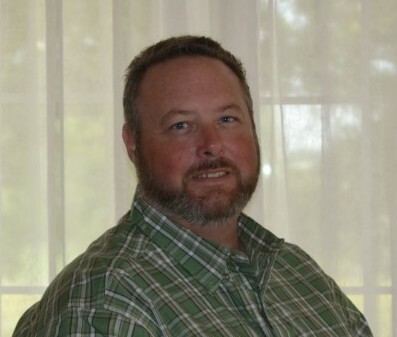 Aaron serves his community and profession as a Township Treasurer where he lives and is currently an elected Director of the Kansas Society of Land Surveyors (KSLS). He is a graduate of the 22nd Class of Leadership Emporia. Aaron can be contacted at aaron.geotech@gmail.com. Beth Higgins has been with Geotech for over 20 years. She holds a BS in Science from Emporia State University. Beth is just as comfortable driving an ATV out in the Flint Hills looking for cornerstones as she is in the office helping our clients with their surveying needs. Beth’s expertise in so many areas is why she is usually our client’s first contact. 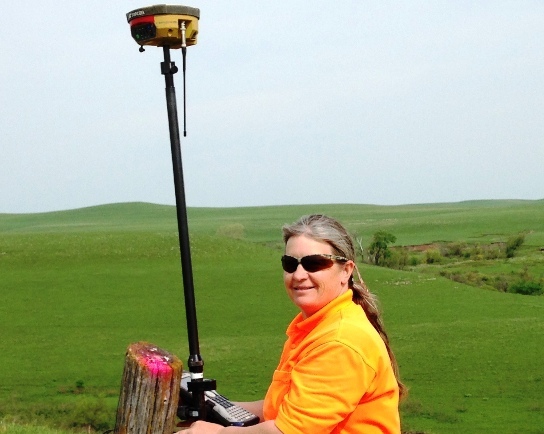 Beth can manage and make your project with Geotech go smoothly and efficiently. She is also a graduate of the Emporia Area Chamber of Commerce Leadership Class and enjoys following her grandchildren’s school activities. Feel free to contact her either by phone at (620) 342-7491 or by email at beth.geotech@gmail.com.